In this How To Put On A Silver Cuff Bracelet Video Dillon starts out by talking about why Silver Cuff Bracelets are so popular and the advantages of buying a Silver Cuff Bracelet as oppossed to Silver or Gold Bangle Bracelet. Dillon describes how it is easier to find a silver cuff bracelet that fits you then to find a bangle that fits you. Silver Bangle Bracelets or other bangle bracelets are a fixed size and are made to go over the whole hand, so once they get over your hand they are really loose, or too loose. Silver Cuff Braclets can be made smaller or slightly larger to make them fit a few different sizes of wrist. Dillon Hartman then shows you his special "Sign Language C" technique on How To Put On A Silver Cuff Bracelet in this video. Once you have mastered this trick, you will be able to find many sterling silver cuff bracelets that fit you. This will open you up to many options as far as cuff bracelets are concerned. The other advantage to watching this How To Put On A Silver Cuff Bracelet Video is that you will never bend your silver cuff bracelets again to put them on and take them off. This will make your cuff bracelets last long enough to be come heirlooms. Check out our How To Put On A Silver Cuff Bracelet Video on Youtube! Above and to the left is a roundel Blue Gem Turquoise bead bracelet by Nattarika Hartman. This bracelet is made of roundel shaped Nevada Blue Gem Turquoise beads. These Nevada Turquoise beads are strung on beadalon wire and finished off with a sterling silver clasp and extender chain. 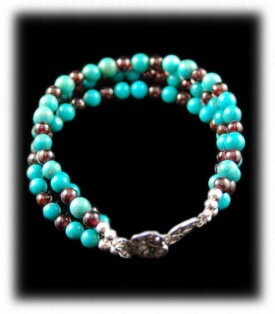 This Turquoise bracelet can be worn with any outfit or wardrobe and is very attractive when worn. A great example of a bracelet you will be able to wear after watching our How To Put On A Silver Cuff Bracelet Video. To the right is a channel Turquoise Inlay Bracelet in Sterling Silver with Bisbee Blue Turquoise. 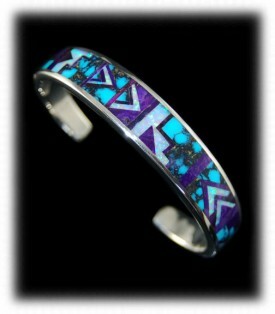 This type of channel Inlay Bracelet has been made in Durango for about fifty years. We got the patterns for this Bracelet when we purchased the Bisbee Turquoise Collection from the decendents of Cecil Mickelson who was Bob Mathews partner. 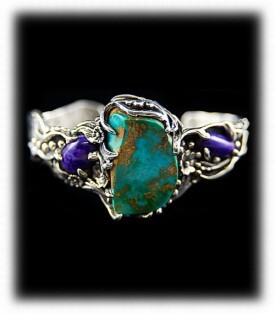 Bob and Cecil had the rights to extract the Bisbee Turquoise from the Bisbee Mine in the 60's and 70's. They brought the Turquoise to Durango, sorted it, sold it and made it into Turquoise Jewelry at the Mickelson Jewelry Company of Durango, Colorado. A great example of a bracelet like seen in our How To Put On A Silver Cuff Bracelet Video. To the left is a Lost Wax Vine and Flower Design Sugilite and Royston Turquoise Bracelet by John Hartman. This heavy sterling silver bracelet is a true work of art that you are sure to never see another alike. The bracelet features a large semi - nugget cut piece of Natural Royston Turquoise from Tonopah, Nevada. The turquoise is complimented by two oval purple Sugilite stones from the Wessel's Mine in South Africa. Click on the link to see more photos and descriptions. A great example of a bracelet you will be able to wear after watching our How To Put On A Silver Cuff Bracelet Video. To the right is a Navajo Gemstone and Turquoise Inlay Bracelet. This is a beautiful and artistic piece that was created in Sterling Silver and inlaid with Turquoise, Opal and Sugilite. 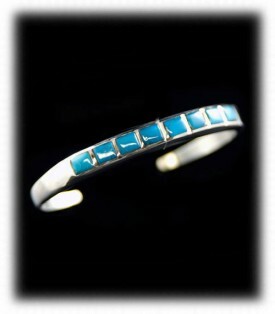 Durango Silver Company tries to keep as much of this quality Turquoise Inlay Jewelry on hand as possible at all times. A great example of a bracelet like seen in our How To Put On A Silver Cuff Bracelet Video. We hope you have gained some useful knowledge from our The How To Put On A Silver Cuff Bracelet video. We invite you to learn more about Silver Jewelry, Indian Jewelry and Turquoise Jewelry by following the links in our Learning Center which has many other informational pages that we have written on topics related to Southwestern Silver Jewelry. In addition, we would like to invite you to join our E-Mail Newsletter - about once every other month we send out a Newsletter to inform our members of what's happening with Durango Silver Company, new products, specials for our members and more. We also have a monthly drawing from our members to Giveaway free Turquoise Jewelry from our company. Please take a moment to become one of our friends and future winners in our giveaway by signing in below. We hope you enjoyed our The How To Put On A Silver Cuff Bracelet Video.